Operation Christmas Child counts on in-kind donations to ensure each shoebox gift is full and of the highest quality. 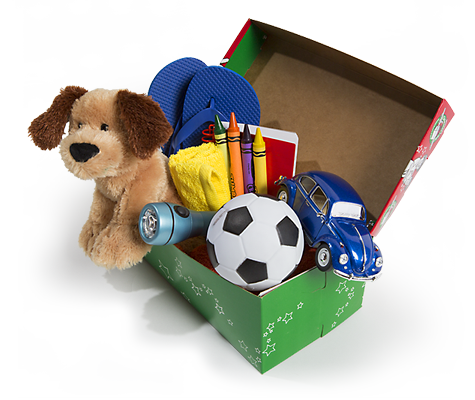 We use donated items from organizations and businesses as filler items and to replace items that may harm a child or damage the shoebox. Most in-kind donations we receive are discontinued, imperfect, or overrun items that companies can’t sell, but would make great gifts for needy children around the world. You can donate any time during the year, and we’ll provide free pickup and shipping if you’re donating one or more pallets of items. Your donation is tax-deductible. You can also donate services such as transportation. Millions of shoeboxes are collected at thousands of drop-off sites, and we have to move those shoeboxes to our processing centers to be sorted and shipped. The list below includes more suggestions for items and services you can donate. Click on the categories for more information. Your donation will make a difference in the lives of needy children and families all over the world. Call (855) 356-0252 or complete the form below. Samaritan’s Purse is a 501(c)(3) organization, and all gifts are tax deductible to the full extent allowed by law. Samaritan’s Purse is audited annually by an independent public accounting firm, and our audited financial statements are available upon request at: Samaritan’s Purse, P.O. Box 3000, Boone, NC 28607, Attention Finance Department, or by calling 828-262-1980. View solicitation disclosure information for Samaritan’s Purse. If you have a question about your product or service as a gift-in-kind, please contact us via the form below. Equipment can be given outright, loaned to us for a short time, or donated as a rental. Before being shipped overseas, each gift must be inspected and prepared. Millions of shoeboxes and thousands of volunteers take up a lot of space. You can help us each fall by donating empty warehouse space to be used as a processing center. Facilities from 30,000 to 100,000 square feet are needed near Atlanta, Baltimore, Dallas, Denver, Los Angeles, and Minneapolis. Examples include pens, pencils and sharpeners, erasers, crayons, markers, notebooks, paper, solar calculators, coloring and picture books, etc. Examples Include t-shirts, socks, hats, gloves, sunglasses, hairclips, jewelry, watches, flashlights, batteries, plastic storage boxes, etc. Examples include stuffed animals, dolls, small cars, balls, kazoos, harmonicas, yo-yos, jump ropes, toys that light up or make noise, etc. Examples include toothbrushes, bar soap, combs, washcloths, etc. Examples include metalworking, woodworking, knitting/sewing, leather, beading, children’s craft projects, etc. In the U.S. alone, millions of shoebox gifts are collected at thousands of drop-off sites in all 50 states and Puerto Rico. We are looking for companies interested in donating or discounting transportation on a state or national level. Your gift of print, radio, television, or online advertising or airtime can have a tremendous impact by inspiring more individuals to pack shoebox gifts. Gifts such as tickets to events or attractions can provide exciting incentives that can be used during Operation Christmas Child special promotions or contests. After receiving a shoebox gift, many children have the opportunity to learn more about the Gospel through our biblical discipleship program, The Greatest Journey. You can donate printing for leaders’ guides, lesson books, or New Testaments.